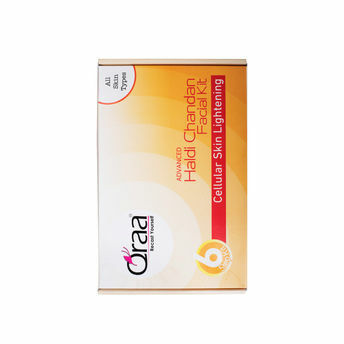 Qraa Haldi And Chandan Kit is an easy way to get instant shine and lustre in just 6 steps! It's a unique formula packed with the goodness of Haldi and Chandan that are known for their skin lightening and repairing properties. This is a perfect blend of Honey enzymes with the essential oils of Rose and Jasmine that not only repair the harm done by UVA and UVB rays of the Sun but also reduces the fatigue and sun tan. It helps in exfoliating dead epithelial cells, blackheads and white patches and helps retain the complexion making your skin look fairer and brighter.